the amazing andPlay! violin/viola duo performs a set of experimental music of our time at the cozy Galleri 21 in Malmö! Length of the show: 75min. 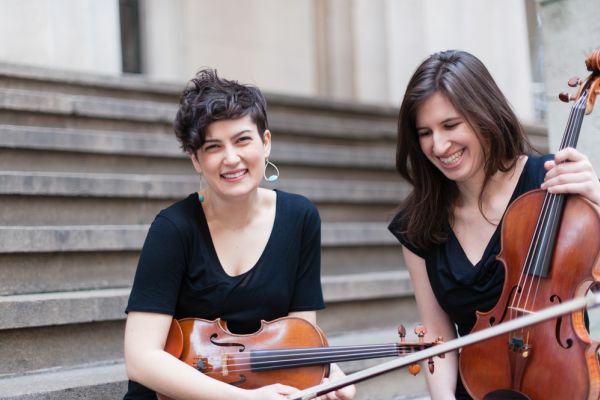 The New York City-based duo of Maya Bennardo, violin, and Hannah Levinson, viola, first played to an eager crowd on Fire Island in the summer of 2012, and has since premiered over fifty new works, close to thirty of which have been commissioned. andPlay has collaborated closely with numerous composers, including Robert Honstein, Scott Wollschleger, Clara Iannotta, David Bird, Bethany Younge and Ravi Kittappa, and consider those relationships to be an integral part of their artistic process. Honstein praises the duo for their "consummate professionalism, fierce musicality and an unflappable good spirit." Their upcoming season includes premieres of new works by Kristofer Svensson, Sky Macklay, and Anthony Vine. Recent highlights include a California tour with performances in San Francisco, Santa Cruz, Los Angeles, and San Diego, a Midwestern tour (including performances at the Toledo Museum of Art and Short North Stage in Columbus, OH), and a performance as guest artists at the 2017 Omaha Under the Radar Festival (Omaha, NE). The duo has also performed at the NUNC!2 Conference at Northwestern University, the New Music Gathering at Peabody Conservatory, and the String Theories festival in New York City, as well as at venues including Roulette, The Stone, The DiMenna Center in NYC and The Record Company in Boston, MA. Beyond the concert stage, Maya and Hannah are passionate educators offering workshops in contemporary string techniques, chamber music coaching and composition notation for strings. They have offered performances and masterclasses at UC Santa Cruz, Western Connecticut State University, Bowling Green State University and are Artists-in-Residence at the Snow Pond Composers Workshop (Sidney, ME).